​Welcome to the market leader in Eco friendly pallet packaging. "A reusable pallet wrapper and a more secure green alternative to stretch film"
Pallet Wrapz® are an eco-friendly reusable alternative to plastic stretch film made of heavy duty ventilated and breathable mesh or opaque vinyl. The Wrapz are easier and quicker to install and remove saving time and money. They are ideal for toting product within a dock area or from one side of the warehouse to another. They are fabricated with a clear vinyl window for ticket placement. 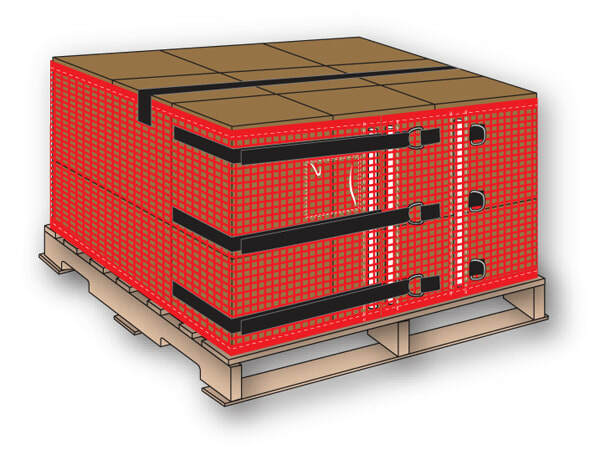 We produce the original and patented Cart Wrapz ® for U-Boat Carts and pallet wrapz for pallets. Always consistent amount of force on the load. 10x stronger!